Ever since the severe nuclear power plant accident of 3.11, Japan and the entire world — to greater and lesser degrees — are now facing the need for alternatives to nuclear power. A lively discussion over a nuclear-free and fossil-fuel free future has ensued, which portends a shift to renewable energy like solar power generation. Many arguments assert this possibility for the mid- and long-term, even if it is impossible now. Many other arguments assert achievement of this possibility mid- to long-term, with efficient usage, during the unavoidable interim, of natural gas, which imposes a much smaller environmental burden (starting with CO2 emissions) than other fossil fuels. Yet mid- and long-term are probably just a dream. In 1976 after the oil crisis, Amory Lovins announced Soft Energy Paths, his books that presented the possibility of a society in the early 21st century mainly reliant upon renewable energy. The book was widely popular in the 80’s, but absolutely nothing materialized. In fact, natural gas will most likely not be a short-term energy stopgap, but a key energy source for several centuries ahead. Here is why. Meeting the greater part of demand with renewable energy means to take energy sources available since before the industrial revolution, and supporting a sophisticated urban society whose average life expectancy has doubled since the revolution, while the global population has increased by an order of magnitude. The buildings, rail stations, and roads that make up the urbanite’s landscape and all of the goods surrounding him or her are made with enormous amounts of artificially generated energy. Besides the goods thus manufactured, massive amounts of energy are necessary to move cars and trains, for heating, cooling, lighting, cooking and bathing, and for potable water, waste water and waste disposal. The largest demand for energy in modern society is manufacturing goods containing food and transporting them. Without massive, inexpensive, and stable energy supplies, modern civilization with a huge population and urban lifestyle could not be sustained, even for a single day. Interestingly, electricity constitutes 20% to 25% of the final energy demand, while direct consumption of fossil fuels comprises the remaining 80% to 75%. Further two-thirds of the electricity is generated by power plants consuming fossil fuels. An inspection of the history of civilization and the principles of energy consumption by humans must be thoroughly understood in order to know whether renewable energy can assume a key position. While an abundance of criticism portrays 3.11 as a pivotal moment in the history of civilization, the critics thus spoken have hardly any comprehension of energy fundamentals with respect to modern civilization. Modern society, whose population is 10 times greater and average life expectancy above 70 years, has come about through warm clothing, overabundant food, and hygienic society attained through energy consumption on an order 40 times greater than before the industrial revolution and centered on fossil fuels. The pre-revolution society met its entire energy consumption needs from renewable energies—firewood or charcoal, water wheels, windmills, and oxen and horses. The indices for principles of energy use, “energy returned on energy invested” (EROEI or net energy ratio) and “power density” for each energy source, are necessary for understanding the basics here. The EROEI is an index of energy efficiency that describes how many units of energy must be invested initially for humans to be able to utilize 1 unit of energy, for any energy source. This index underscores the most important factor: the cost of such energy. A small figure means that no matter how abundantly in existence or how low the environmental burden, such an energy source cannot support urban society with enormous populations. The following example helps to explain the principle. No matter how many hundreds of fast-moving game like rabbits are around to be hunted, if the hunter’s equipment or physical ability to capture one rabbit requires an investment in energy equal to the calories held by one rabbit, then the hunter is doomed to starve. The EROEI ratio is just a few multiples for renewable energy sources prior to the industrial revolution like firewood or charcoal and water wheels, a few ten multiples for coal, the driver of the revolution, and a multiplier of 50 even today globally for petroleum and natural gas whose full-fledged usage began in the 20th century. In comparison, solar power generation, which seems highly efficient in its application of quantum theory, has a multiplier of 5 to 7, while wind power generation has a multiplier of around 10—just slightly higher than firewood and charcoal, water wheels, or oxen and horses. Next, power density is defined as output per unit area of ground surface and represents the direct load to land use and ecology. Most renewable energy directly or indirectly exploits sunlight with its low energy density flow. An effort to obtain large output on the order of a fossil-fuel combusting or nuclear power plant, therefore, would require occupation of vast stretches of the earth’s surface. Despite zero CO2 emissions, a large, direct burden would be imposed on ecosystems through forest destruction, for example. The power density of a mega-solar power plant is 1/2,000 of a combined cycle, natural gas power plant, which has the highest power density. The former captures sunlight across a vast area for an overwhelmingly greater direct burden on ecosystems. In other words, despite near zero CO2 emissions, large-scale exploitation is no longer environmentally friendly. Mesopotamia and numerous other ancient civilizations collapsed under forest destruction resulting from excessive exploitation of renewable energies such as firewood and charcoal, and oxen and horses. Thus, from perspectives of exploitable magnitude and ecological burden, societies that can increase their share of renewable energy are nations and sparse regions with low population density and extra land. Renewable energy is permanently yoked to the conditions hinging on this principle. Meanwhile, the recent revolution in developmental and production technologies of non-conventional resources such as shale gas has exponentially increased the resource capacity of natural gas and extended minable reserves to several hundred years. 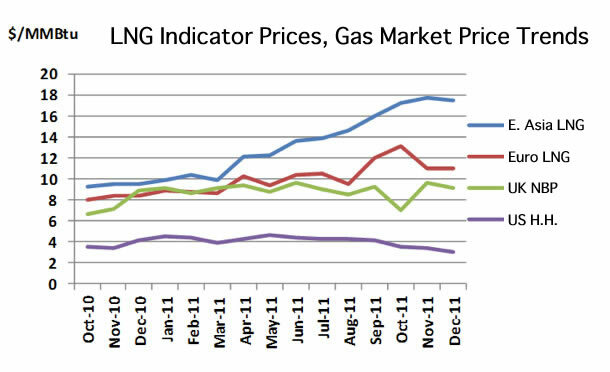 Consequently, the global prices of natural gas have started to fall steeply. 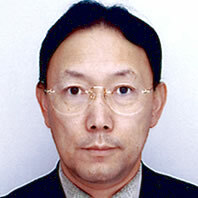 But Japan faces a large challenge ahead in exploiting natural gas. That challenge is the horrifically high procurement price structure of liquid natural gas (LNG) sourced mainly by the electric power industry to date. Natural gas procurement costs for Japan currently run six times greater than the U.S., 1.5 to 2 times Europe, and 1.5 times China. This absurdity is aggravated by pipelines yet to be constructed for connecting points within Japan or internationally. The physical acquisition and exploitation conditions pale in comparison to developed nations and even China and Korea. Unless a solid mid- and long-term procurement strategy — thus far non-existent — is established to gain pricing at least on European levels, the low-cost, low environmental-burden, nuclear-alternative policy centered on efficient use of natural gas will remain only on paper. Either the Japanese economy will sink under the appreciation of electricity prices, or else a full reinstatement of the nuclear power plants will become mandatory. Regardless of the tenor of the media, common sense among the energy experts considers natural gas an irreplaceable key energy in the form of combined cycle generation and cogeneration as a way to keep Japan from ruin. Development of procurement and effective use strategies for natural gas continues to be neglected, however.